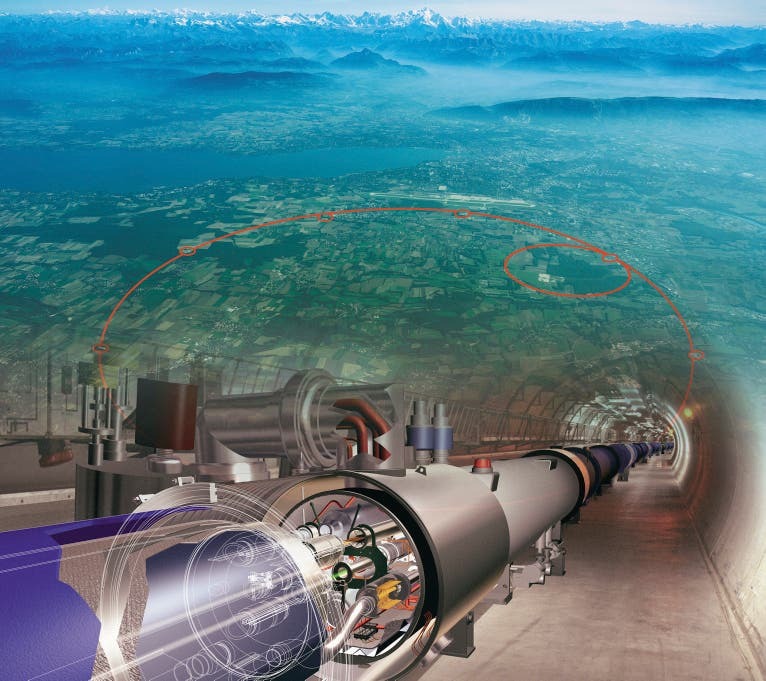 Collisions between protons and lead ions at the Large Hadron Collider (LHC) have produced unexpected behavior in some of the particles created by the collisions, creating a new type of matter known as color-glass condensate. When beams of particles crash into each other at high speeds, the collisions yield hundreds of new particles, most of which fly away from the collision point at close to the speed of light. However, the Compact Muon Solenoid (CMS) team at the LHC found that in a sample of two million lead-proton collisions, some pairs of particles flew away from each other with their respective directions correlated. "Somehow they fly at the same direction even though it's not clear how they can communicate their direction with one another. That has surprised many people, including us," says MIT physics professor Gunther Roland, whose group led the analysis of the collision data along with Wei Li, a former MIT postdoc who is now an assistant professor at Rice University. A paper describing the unexpected findings will appear in an upcoming issue of the journal Physical Review B and is now available on arXiv. It has been theorized that proton-proton collisions may produce a liquid-like wave of gluons, known as color-glass condensate. This dense swarm of gluons may also produce the unusual collision pattern seen in proton-lead collisions, says Raju Venugopalan, a senior scientist at Brookhaven National Laboratory, who was not involved in the current research. Venugopalan and his former student Kevin Dusling theorized the existence of color-glass condensate shortly before the particle direction correlation was seen in proton-proton collisions. While protons at normal energy levels consist of three quarks, they tend to gain an accompanying cluster of gluons at higher energy levels. These gluons exist as both particles and waves, and their wave functions can be correlated with each other. This "quantum entanglement" explains how the particles that fly away from the collision can share information such as direction of flight path, Venugopalan says. The correlation is "a very tiny effect, but it's pointing to something very fundamental about how quarks and gluons are arranged spatially within a proton," he says. The CMS researchers originally set out to use the lead-proton collisions as a "reference system" for comparison with lead-lead collisions. "You don't expect quark gluon plasma effects" with lead-proton collisions, Roland says. "It was supposed to be sort of a reference run—a run in which you can study background effects and then subtract them from the effects that you see in lead-lead collisions."